NEW YORK (Reuters) - An Apple-led tech rally pushed Wall Street higher on Thursday as jitters over the Federal Reserve's forecast of an economic slowdown were calmed by upbeat economic data. Apple Inc led the tech sector's advance, rising 3.7 percent ahead of the company's expected streaming service debut next week. 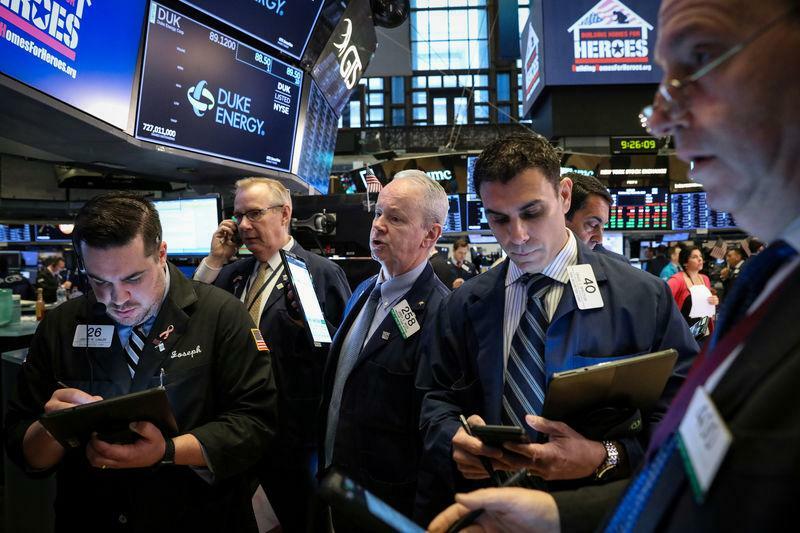 "Today the market move is (due to) Apple's weighting in the Dow, the absence of bad news and the market reacting to the Fed's dovish tone," said Matthew Keator, managing partner in the Keator Group, a wealth management firm in Lenox, Massachusetts. But Keator would remind investors that the Fed was more hawkish just a few months ago. "The market should maybe be a bit more measured in extrapolating too much from the Fed's dovish stance because that could change." Chipmakers also gave technology stocks a lift after Micron Technology Inc predicted a recovery in the memory market as it reported better-than-expected quarterly earnings. Micron's stock jumped 9.8 percent. Rate-sensitive banks came under pressure as the Fed's decision to cease monetary tightening caused the U.S. Treasuries yield curve to flatten to its narrowest spread since August 2007. Conagra Brands Inc beat analysts' quarterly earnings estimates as the packaged food maker raised prices to offset rising costs, sending its shares up 12.8 percent. Shares of Biogen Inc plunged 29.2 percent after the company announced it would halt late-stage trials for its experimental Alzheimer's drug. Strauss & Co soared 31.8 percent as investors welcomed the iconic jeans maker back to the stock market. The 165-year-old company's IPO was priced at $17 per share, and the shares closed at $22.41.